With his eye still trained on the solar system, our doomsayer Jack Sprat adds reports of changes occurring on the Planet Saturn to his list of issues of concern. Thus we take another journey into the world of astrology and space. And lo . . . we find that Mr. Sprat has hit upon another point of interest, at least in the scientific world. As early as 2005, after the space probe Cassini examined the rings of Saturn up close and sent volumes of data back to NASA and other space junkies, it was discovered that dramatic changes had been going on since the Voyager spacecraft buzzed the planet in 1981. It seems that the rings are beginning to dim and move toward Saturn. An outer ring, called the D Ring, moved 125 miles closer to the planet over that 25-year period. Also in 2005, Cassini captured images of continually-erupting fountains of icy material on the moon Enceladus. This has made this moon among the more promising places in the solar system to search for an environment that might sustain life. Mission researchers have since announced evidence that hydrothermal activity may be occurring on the seafloor of the moon's ocean. They also have discovered that the entire moon is covered in a liquid sea. The observations by Cassini also revealed that the rings of Saturn are in a constant state of change and evolution. This is especially true in another outer ring, identified as the F Ring. This ring, astronomers have discovered, appears to be affected by Prometheus and Pandora, two "shepherd moons" that are in constant collision with the space junk that appears to comprise the materials within the ring. They suspect smaller "moonlets" may also be slamming into one another to keep things lively within the ring. Events are occurring so often and so quickly that they say changes in the ring can be observed sometimes within hours. The rings also display colors that change with the seasons, astronomers say. Generally the rings appear to be a pale red. 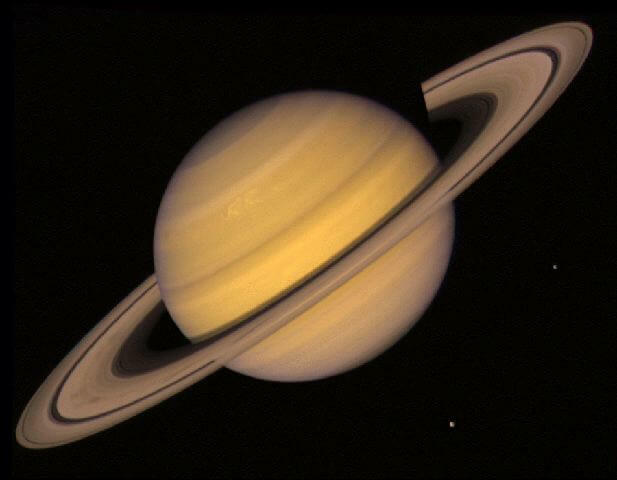 Saturn’s rings are believed to be comprised of space debris and ice. The particles are constantly bumping into each other as they orbit Saturn. The rings are relatively thin, only about 30 feet thick. Cassini also measured Saturn’s energy emissions and discovered that the planet has been emitting gradually less energy each year from 2005 to 2009. It was also discovered that energy levels changed with the seasons and that there was a significant change from the time Voyager flew past the planet in 1981. Is the planet cooling? Is this also a form of climate change? Astronomers who have examined the data explain that because Saturn is tilted like Earth, it goes through regular seasons of summer and winter in its northern and southern hemispheres. Thus Saturn’s weather is variable, with the planet heating and cooling with the seasons. And because of the tilt, the planet’s southern hemisphere receives less energy from the Sun. While researchers see variations, and a general slow cooling down of the planet occurring during the 25 years they have had a chance to study Saturn, they do not know if this trend will continue. And this is probably everything Mr. Sprat and our readers may wish to know about the changes going on with Saturn. While Jack is correct about Saturn changes, we do not find any cause of concern here.